Incredible Platt Park 1/2 duplex that lives like a single family home. Great open floor plan, updated kitchen with granite countertops and stainless steel appliances. Wood burning fireplace and second floor master suite with slate shower and 5 skylights. Newer furnace, water heater and roof. Central AC. 2 bedrooms plus an office. Professionally Landscaped. Newer 2 car detached garage. UNBEATABLE location - walk to Sushi Den, Stella's, Broadway shops and restaurants, Platt and Wash Park, lightrail, and the future Gates redevelopment! 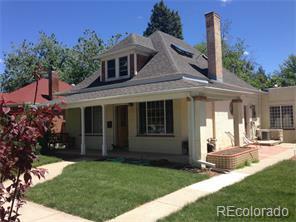 Don't miss this opportunity to move into a turnkey beautifully renovated home in the popular Platt Park neighborhood.